I’m going to get all nostalgic now for this blog post. I was thinking the other day about how theme parks have changed, most notably the ones that I visited as a child – and what I can still remember to this day, my memory isn’t that great ha! I first visited the park in 1998 and have been a regular visitor since then – 20 years on! I still enjoy visiting and seeing how the park has expanded and grown over the years. Of course, I do miss the old attractions that are either no longer with us or have been changed, but it’s the perfect chance to reflect on these and how awesome the park was! 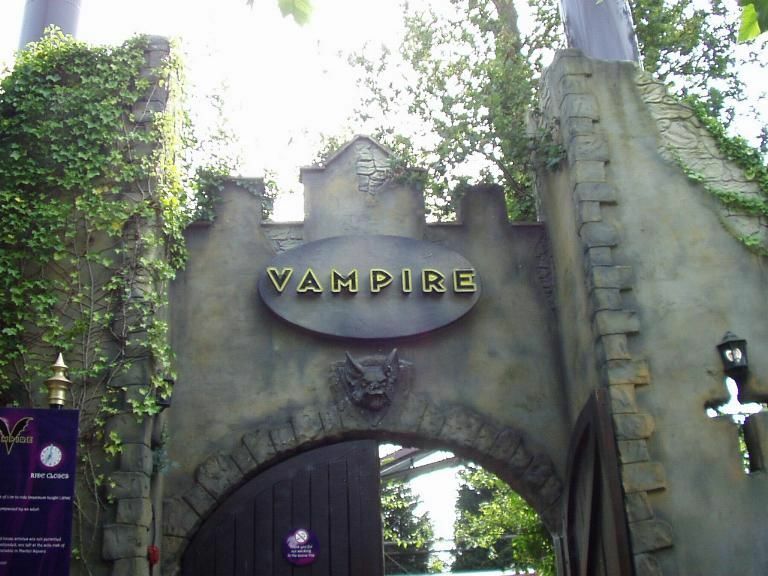 My earliest memory was walking through the big Vampire door entrance and feeling so nervous about the ride. As a kid, it was pretty terrifying as you look up and see the bat style trains flying over you in Transylvania. As you travelled towards the station, it was so dark you couldn’t see much, with the coffins separating each row, the massive chandeliers and of course, the organist ‘playing’ the haunting theme of the ride. Once I had my chance to ride Vampire, I loved it – and to this day I still do. I just wish I had more chance to experience the old-style trains more. Considering this ride is almost as old as me – not quite though. This ride was the bomb. From the pink building or should I say ‘factory’ to the sweet-smelling station and that fountain strobe finale. There is nothing about this ride that I won’t miss – it was so good. It was mad, it was crazy, it was great. The whole ride experience, as you follow Professor Burp through a tour of his factory, making all sorts of fizzy pop style drinks. It’s a ride I will not forget in a hurry. I managed to experience Terror Tomb before it changed its name to Forbidden Tomb and what is now known to us all as Tomb Blaster. This ride actually scared me when I first rode it. As a kid back then, I didn’t really understand the whole ‘story’ to the ride with Abdab. Then again, who does concentrate on the story when you’re a kid. Funnily enough, the only real vague memory I have is of the finale with the Singing/Dancing Mummies or ‘Jukebox Duel’. Looking back at the images some people have gathered up on the internet, it is all coming back to me. Oh Samurai, you beauty! Well, back when you were at Chessington. I absolutely loved Samurai at Chessington, the black and red colour scheme, the lights, the ride cycles, everything! I remember back when the park shut at 9pm for the Summer season and seeing the lights on Samurai through the trees as we left the park for the day. And being one of the taller kids at school, I reached 1.4m relatively early so I could experience it before it moved to Thorpe Park. How could I not include Beanoland! It was pretty much like stepping into the Beano comic and everything had come to life. The Dodgems, Billy’s Whizzer, Bash Street Bus, Dennis’ Madhouse – it was a great collection of rides and attractions for kids. You also had the chance to meet the characters, I vaguely remember seeing Dennis and Gnasher. Let’s also not forget the fab Treehouse in the middle of the area which had a show where I also ‘vaguely’ remember Dennis throwing t-shirts at the crowd – if someone can confirm this, that would be great! I don’t if it comes with age or something, but I do love being nostalgic and remembering the old times of our favourite theme parks. I’m sure there are more memories that I haven’t included in this post – like I said before, I don’t have the best memory and these are the ones that stick out the most for me. Kids these days won’t remember the classic Chessington and its array of ‘crazy’ attractions it had. If you have any early memories of Chessington, feel free to leave a comment below and let me know if I have missed anything!